Discussion in 'Worldwide Disney Parks' started by AlexanderMBush, Jan 22, 2019. Disney has revealed that Zootopia, will be recieiving a land for the next expansion of Shanghai Disneyland. Construction begins this year, as this comes with Disney responding to the film's Chinese success. tankart150, Orlandofan12 and LintemuthStudios like this. Bring this to animal kingdom Disney! OrlLover, tankart150, LintemuthStudios and 1 other person like this. OrlLover, tankart150, AlexanderMBush and 1 other person like this. I think it's telling they aren't automatically saying an exclusive on this. Also tells me, Zootopia 2 is in some form of development as of now; if they intend on riding this through. It makes money, a funny amount; and a part of me would expect it to pop up sooner than later in the states...but not at DAK. Food for thought though..what if this replaces Pooh? China is going to ban Winnie The Pooh in the coming months, so it'd only be natural if maybe Disney wanted to snuff the bear and his pals out, to avoid conflict with the Chinese government? The only place Zootopia would fit, thematically, would be Hollywood Studios. Andysol, Quint, Jones14 and 2 others like this. tankart150, LintemuthStudios, GadgetGuru and 1 other person like this. I saw Hastin's post, and thought about it. Then I proceeded to edit a post in particular, to kind-of..bring that up. It would..spark some questions. For one, size. Pooh seems very much of a micro-section to Fantasyland; acting only as a dead end. You can't do much, unless you intend on radically changing how you get the parades around the park for their next performance. And there's the question of the launch bay's for all of the fireworks. So basically anything that doesn’t fit perfectly with the other parks just throw it in Hollywood Studios? Flawless logic! Put it in World Showcase! Frogki, Quint and Disneyhead like this. I mean, the intent that Hollywood Studios is starting to shift in, is to "live" in the worlds of these movies and projects that Disney has made. TSL and Batuu come extremely quick. What interests me with the Shanghai Zootopia, is where they could go with it. If it replaces Pooh, would it be a simple retheme? Or would they completely demolish the area, leaving only the spinner to be rethemed to Mad Tea Party? Zootopia, being a city, is an urban environment, and the story has nothing to do with any of Animal Kingdom's thematic concerns about respect for wildlife and attempting to live in harmony or balance with nature. Just because a story is populated by anthropomorphic animals does not mean it belongs in Animal Kingdom. tankart150, Joe, malice and 3 others like this. I would assume, they'd do similar for Zootopia; taking you into that world, and making it an immersive experience. I just feel that Zootopia is a no brainer for Animal Kingdom. Okay, I get it, it’s a completely loose tie-in because it has animals. But, I’m pretty sure NOBODY that enters animal kingdom will scratch there head wondering why a city with an animal themed land is in the park. This actually would make more sense than Avatar. So basically ANY themed land could fit Hollywood studios? I disagree 100% with this. Toy Story Land doesn’t fit with any of the parks in Orlando. They just dumped it in HS because it’s geared towards kids and it needed that in the park. Neither does Avatar and yet it worked beautifully. I don't think Pandora is much of a major thematic break in Animal Kingdom. The movie is explicitly about some of the concerns the park addresses. Frogki, tankart150, Quint and 2 others like this. I never said ANY themed land. That's not the intention of Galaxy's Edge, and while TSL was a call made to cater towards expanding their use of the Toy Story IP in a large-scale fashion that none of the domestic parks have done thus far. Paris, Tokyo, Hong Kong, and Shanghai; have all pushed towards that. And with TS4 being as it is, it would make sense to capitalize on an "Evergreen" Pixar IP. One in particular, that made 3D animation what it is today. And even then, with TSL being in Orlando; they made sure for when you are within the land itself, to try to make it as well done as they could (even with the mountains of Batuu to the left). The Picket Fence theming, can be an example of that. Also, while I do think aspects of Pandora don't work with DAK at all..it blends in better than what Zootopia could. Can we talk about the domestic parks getting Zootopia to it's own thread though? Especially considering, this thread is about a Zootopia land in Shanghai? Well you already said that this was a stupid land to add in this park before it was officially announced. So there’s not much to talk about on this topic with you huh? Nothing really in the article but it does say “unique to Shanghai...” which could just mean that it’s only found here as of now. That said, it makes stupid sense for Zootopia to be at Shanghai, more-so than Avatar. Stupid Land, and Stupid Sense; are two different thing's. I would venture to guess, it'd be just as "Unique to Shanghai" as to how Tron was "Unique to Shanghai". 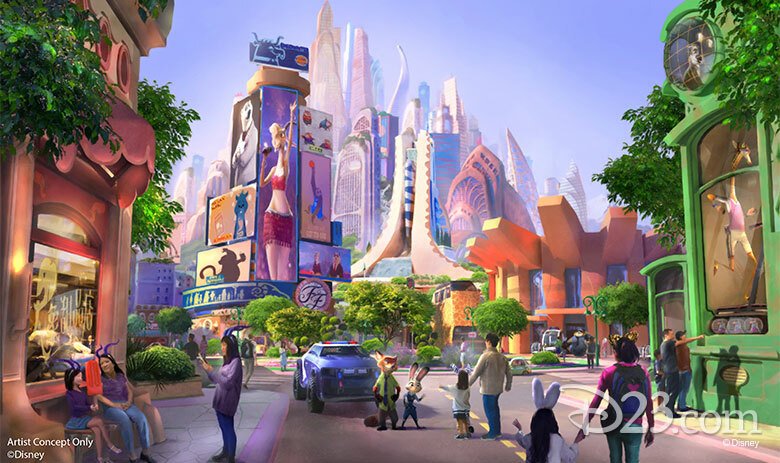 Zootopia has a lot of climates, and a lot of attraction possibilities. If I'm willing to bet, I am almost thinking this is their Pandora; with one attraction being a simulator using the Flight of Passage system as you "Glide around the many places that inhabit the commune of herbivores and carnivores". And the other, would be the proper dark ride, with both Judy and Nick present. It’s all up to interpretation but yeah that was my thought as well.